The Chart Settings window consists of several thematic tabs of options for calculating and displaying horoscope charts. The Font tab contains options for selecting fonts for chart elements, for on-screen display and for printing. double-clicking in an empty region of the Chart tableau. Then by clicking the "Font" button at the top of the window, or typing the 'T' key. Text Font - used for Chart tableau header information, and the reference matter (system of houses, etc.) displayed at top-left of the tableau. This font is also used for the info tooltips. Small Font - used for planets' degrees on glyphs (select by checking the Degrees of planets option on the Format tab), and for asteroid and star names on the chart wheel. It is also used in parts of the Aspects Grid. By default this is Arial Narrow 6 point. When checked, ZET utilizes an internal bitmapped font for the astrological glyphs - planets, aspects, etc. ZET Font button - opens a File selector dialog, allowing you to load and use alternative glyphs, if they are available. Glyphs are stored in sets in .fnt font files. ZET glyph fonts are described fully in the Glyph Editor topic. 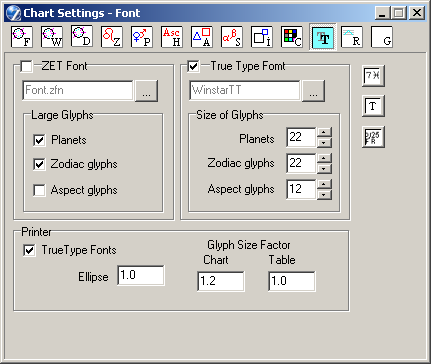 Large Glyphs - allows individual setting of glyph size for planet, zodiac and aspect glyphs. When checked, large (32x32) glyphs are used; otherwise small (16x16) glyphs are used. When checked, ZET uses astrologically-enabled TrueType fonts (e.g. 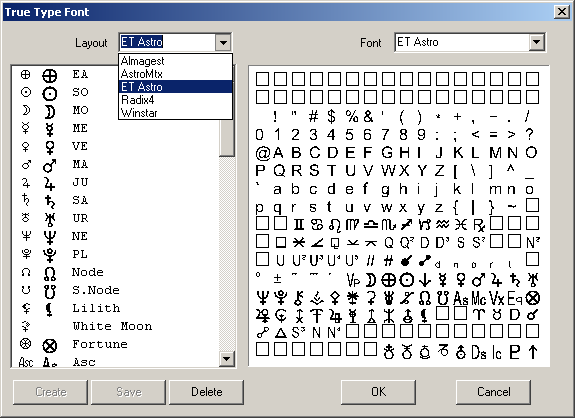 WinstarTT) in place of its bit-map fonts for astrological glyphs. TrueType Font - opens a File selector dialog, allowing you to load a suitable TrueType font file. See "Setup True Type font layout" below. Size of Glyphs - allows individual setting of the (point) size of glyphs for planets, zodiac and aspect glyphs. Ellipse - sets an ellipsoidal correction factor. The default setting is 1.0 (i.e. circular). If printing deforms the chart wheel graphic, try adjusting this value up or down. To choose a font and setup a layout, you can use a True Type Fonts Wizard, which invoked by "Browse" button (right of font name field).